No visit to Cyprus is complete without sampling all of the mouth-watering delicacies that Cyprus has on offer. From the Meze and the Yemista to the Moussaka and the Kleftiko, every dish has a distinctly Cypriot flavor that you’d be hard put to find anywhere else. You better be ravenous when you order a Meze. A Cypriot favorite, it is not just one tidbit but an assortment of Mezedes. Order it and you can expect an interesting platter with a medley of 20 or 30 different savories and appetizers including halloumi, feta, smoked ham, octopus, koupepia or stuffed vine leaves, sliced artichokes, hummus, olives, barbouni, a delicious red mullet and succulent pieces of turkey or chicken. Eating a Meze is an experience in itself. Take your time and savor every delicious bite. Another popular Cypriot dish, Yemista are an assortment of different types of stuffed vegetables. They can be eaten hot or cold and can be ordered as starters or even as a main dish. Koupepia, the famous stuffed wine-leaves are eaten cold and are almost a staple everywhere you go. Yemista also includes stuffed aubergines, courgettes, peppers and tomatoes and the stuffing typically consists of grated tomatoes and rice or minced meat flavored with mint or parsley. A must at every celebration, Kleftiko consists of a piece of goat or lamb wrapped in foil and baked in a special kind of oven. Another must-eat in Cyprus, Mousakas is a traditional baked dish prepared with minced beef or lamb covered with layers of sliced aubergine, zucchini and potatoes and topped with a cream flavored with ‘artesia’ spices. 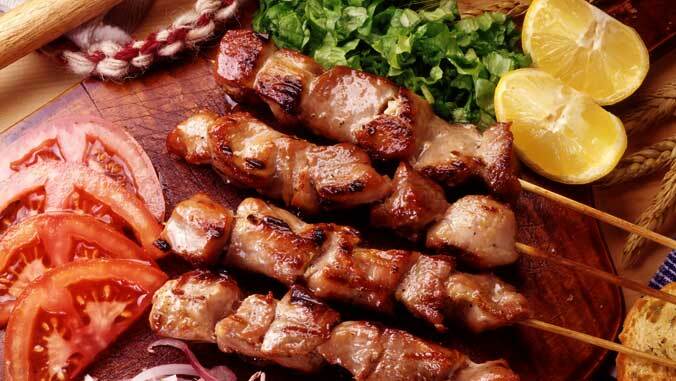 Also called Kebab, Souvlaki is either bits of pork or lamb put on a skewer and slow-roasted on a charcoal fire. It can be eaten by itself accompanied with pita bread and chopped onion or the meat could be stuffed into the pita bread with yiaourti, a flavorsome local yoghurt.